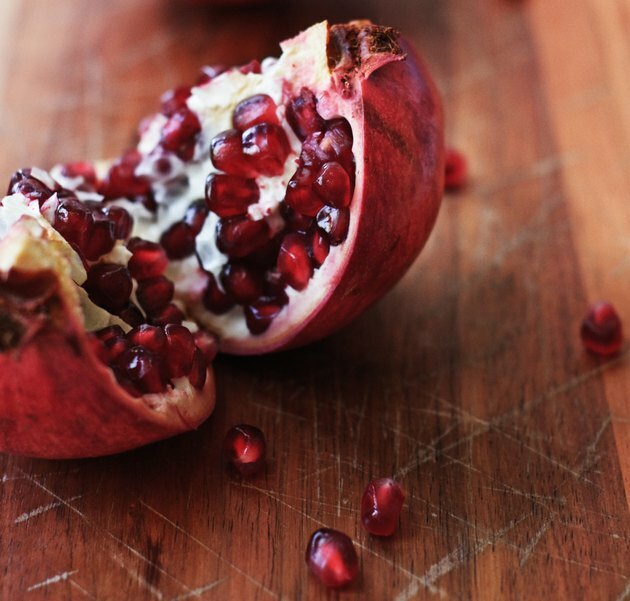 Pomegranates may decrease your risk of cancer and heart disease because of the antioxidants found in them. It may also also decrease your levels of LDL, or bad cholesterol, which can allow your blood to flow more freely through your veins. Despite their health benefits, pomegranates aren't as low in calories as other fruits -- enjoy them in moderation. You can only eat the seeds of pomegranates, but not the fleshy part around it. One medium fruit contains about 235 calories. The majority of the calories come from carbohydrates. Pomegranates contain 11 grams of fiber and 39 grams of sugar. Along with the cancer fighting antioxidants it also provides 48 percent of your recommended daily allowance of vitamin C and 58 percent of your vitamin K RDA (See Reference 1). What Are the Health Benefits of Dark-Red Cherries?